The core idea behind Auto is simplicity: for safety's sake, you don't want the user to need to do more than glance at the car stereo screen to know what he or she is doing. (The phrase that Google uses here is "lower cognitive load.") 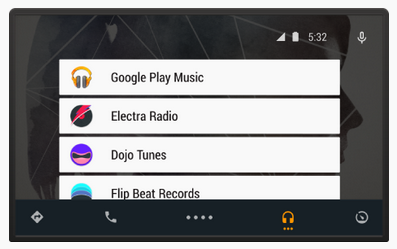 The user interface is standardized: every app will look more or less the same, at least if they hook into the same Android Auto APIs. Note the Music background peeking through on the launcher. The bar at the bottom appears to be a combination notification and action bar, with permanent links to Google Maps/Navigation, a speakerphone function, what's presumably the app launcher (this was shown with Now cards on another site), music/media, and a speedometer icon that hasn't been fully explained yet. The launcher is really just a list of the apps on your phone that include Auto functions. A quick button for Google Now in the corner is accompanied by a clock and what appears to be battery and signal indicators for the connected Android device. Day and night modes will be automatically implemented. A screenshot from Android.com with Now-style cards activated via the center buttons. Like Android Wear, Android Auto isn't intended to function primarily on its own: it gets information and applications from an Android phone. Also like Wear, the "apps" that appear in Auto are really just extensions of their phone counterparts, super-simplified functional expressions of the basic UI that fit into the context of the secondary device. Above: standard Music screen and developer reference. Below: day and night modes. 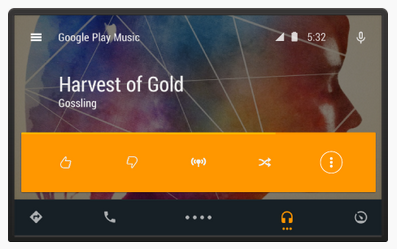 Above and below you can see the screens for the Android Auto version of Google Play Music, or at least a version that's in development. Notice the big, finger-friendly buttons and the highly visible text, even on the menu view. (The screens on the left use text replaced with their relevant actions for the benefit of developers and designers.) Customization in these highly simplified views will be limited: for the media view, Google's page says that only the logo, app background, and theme images can be supplied from the phone app. Separate actions can be implemented, but they have to fit in the context of the media view - see the thumbs up and down buttons that replace forward and back. The rest of the UI is created by Auto, not the developer. When the Android Auto SDK becomes available, it will be possible to test out Auto-enabled apps on current Android devices. 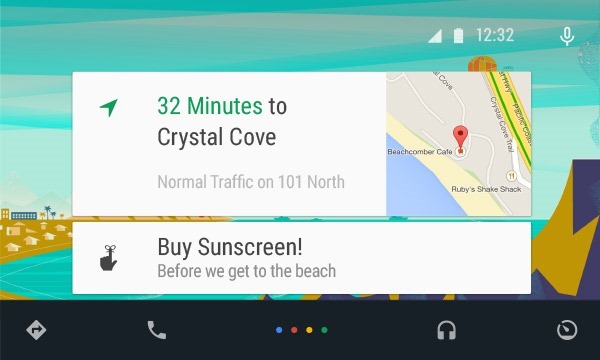 Google says a screen that roughly fits a car dashboard view, like a Nexus 7, will work best. Multiple car manufacturers and electronics suppliers have already confirmed that they are working on Android Auto, including GM, Ford, Chrysler, Audi, Volkswagen, Honda, Hyundai, and Nissan.